Your REAL source for sterling silverware and sterling flatware. 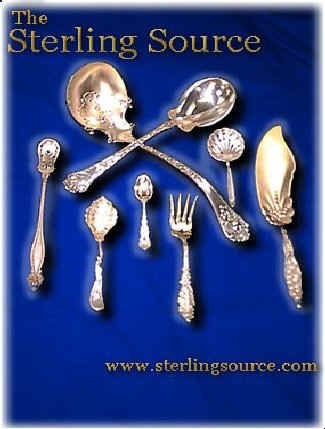 Your Source for Sterling Silverware and Sterling Flatware. Cutlery and some china. Replacement silverware and flatware. 34 Years experience!! PS Think about buying sterling silverware as an investment that you can use and eat with! Try that with silver bars/rounds/coins! CHECK OUR PRICES FOR NEW! We beat the competition! We have much new in stock and do not order and have you wait. We are low overhead with 33+ years experience!! If we sell in California, we have TO COLLECT SALES TAX. California has not yet run us out of business! Many, many antique and older pieces as well. Antique sterling, estate, and sometimes brand new sterling silverware, sterling flatware, silver, cutlery, & tableware from one of the largest and most diverse sources in the country. Virtually ALL manufacturers including several out of production makers and patterns. Alvin, Buccellati, Dansk, Dominick and Haff, Durgin, Easterling, George Jensen, Gorham, International, Kirk Stieff, Lunt, Oneida/ Heirloom, Reed and Barton, Shreve, Frank Smith, Tiffany, Towle, Wallace, Wood and Hughes and many, many more. Over 900 current, obsolete and antique sterling silverware and sterling flatware patterns in stock, one to 200+ pieces in each! We can direct you to other sources for almost anything in sterling!!!! Some golf items also!! Wallace Grande Baroque 24 four piece place size settings New in wrappers $275 each 18 Large Gumbos soups $125 each. Several bowls and a 3 pc Coffee set. Check what others are selling GB for!! Reed and Barton Francis 1st Choice of many Presidents Lots and lots. Great selection of dinner size with the patent date of Jun 1907 date on many on back. Some Alan Adler and Porter Blanchard!!! Used at the clooney blowout dinner for nobama ???? More new settings available. Catering sterling sets are possible. A large, heavy set possible in International Royal Danish up to 40 settings plus serving pieces. Smaller catering sets in several other patterns. Many Soup ladles, sardine forks (small serving pieces 5-7 tines), butter picks, petite four tongs, ice tongs and much much more. We have many Obsolete Patterns/Pieces -- Asparagus servers, mustard ladles, sardine forks, horseradish spoons, side pronged cucumber servers, butter picks...on and on. Inventory varies. A few pieces of early coin silver 900 standard. Current and Out of Current Production Silverware Patterns and pieces. Hundreds of patterns...thousands of pieces. Click>> Collectible Sterling Silverware -- Rare, Exotic, Unusual, and often unique items such as horseradish spoons, mustards, cucumber, and macaroni servers!! Order or inquiry/Inventory information: Our inventory is huge, varied, and constantly changing, so for accuracy, we do not include our inventory on line. We give personal service to your wants. Note: Click Sterling specials at the left to see monthly specials. Also, we will not and cannot do sterling appraisals without having the silver in hand. Gorham Chantilly 4 piece settings plus many serving pieces!!! (Used on Air Force One) Lunch size French or Modern blades each four piece New and estate servers too Click for thumbnail Gorham Strasburg (Strasbourg) Place and dinner. 4 Piece lunch settings $200 -- 4 Piece Place size settings $220- This is the real PLACE SIZE Not LUNCH knives about 9 1/4" Modern Blade with a P in a rhombus (Baseball diamond), Forks 7 1/2" with a P in a Rhombus on the back with standard tea and salad fork. ACORN by Georg Jensen 4 four piece settings Knife 9�, Fork 7 �� Tea 6 1/8� Salad 6 5/8� $455 each setting all polished & ready to go; Several place pieces, and as well Royal Danish hollowware can be added. Many other patterns with 4 piece settings, soup spoons, cocktail forks, butter spreaders and serving pieces available. Call, email flatware@Aol.Com, or click>>> or write for pattern information and availability. Check monthly specials also.